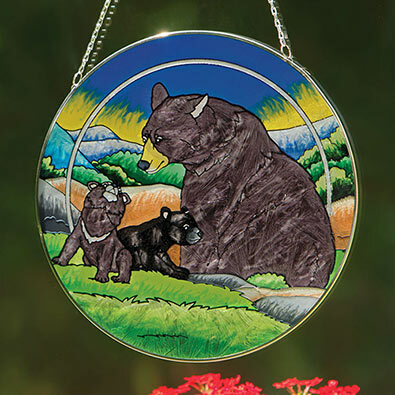 A black bear and her cubs are captured in an dramatic suncatcher for a stunning window display. Hand painted in vivid translucent colour with a metal chain for hanging. Looks beautiful from inside or outside the window. A striking gift for any wildlife lover. Measures 25cm in diameter. Hang this beauty in a sunny window and the sparkling crystal pendant will reflect a pretty rainbow on your walls. Includes a colourful stack of nine crystals and a magnificent faceted crystal teardrop attached to a white ribbon for hanging. 18cm long. Add a little Irish cheer to your home with this classic Gaelic blessing within a brightly coloured Celtic knot border. Perfect to hang in a window or on a wall. Watch as the sun shines through the stained glass to cast a rainbow of colours into your home. Measures 20cm square with metal frame and 18cm chain for hanging. Give a touching sentiment that puts into words the lasting kinship you share with your sister. A beautifully painted art glass suncatcher that catches the light for a stunning window display. A thoughtful gift measuring 23cm x 17cm complete with metal chain for hanging.